NEW DELHI (CNS) — Fear gripped Muslim Rohingya refugees in India following a hardening of New Delhi’s insistence that Myanmar take them back. 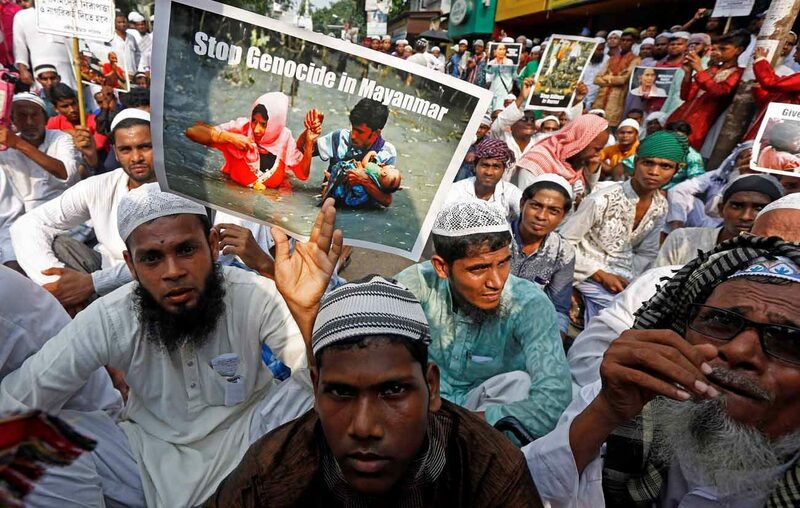 While the majority of 600,000 Rohingya fleeing a military crackdown in Myanmar over the past two months have gone to Bangladesh, some have traveled to countries such as India and Nepal, reported ucanews.com. Earlier waves of Rohingya refugees ended up in India. “Nothing has changed in Myanmar, so how can we go back?” asked Mohammad Hanif, who three years ago came to the capital, New Delhi, following attacks on his community in Myanmar’s Rakhine state. Hanif, who collects recyclable waste for a living, told ucanews.com that his family’s aim was not to acquire luxuries, but to avoid death and destruction. The concerns of Hanif and his Rohingya companions living in shanties in the Madanpur Khandar area, on the capital’s outskirts, have deepened since India pushed Myanmar to take back Rohinghya refugees from Bangladesh. Indian Foreign Minister Sushma Swaraj said during a visit to Bangladesh Oct. 22 that Myanmar should take back Rohingya from Bangladesh. The call dovetailed with New Delhi’s determination to deport many of the 40,000 Rohingya refugees dispersed in several Indian cities. The Indian government recognizes fewer than 14,000 as refugees and categorizes the rest as illegal migrants deserving of deportation. Hanif earns 250 to 400 Indian rupees (US$4 to US$6) a day that he says is enough to survive in the polyethylene-covered shack his family calls home. His 6-year-old daughter goes to a nearby government school. “We face immense hardships, but there is no threat to our lives,” he said, adding that return to Myanmar would constitute a death sentence. In New Delhi’s Rohingya shanty settlements, residents such as 70-year-old Asad-ul-Islam have to travel long distances to get drinking water. He loads plastic drums onto a cart during the fading light of early evening to reduce the danger of harassment when obtaining water for his family, including his pregnant daughter. Earlier this year, unidentified men in the city beat a young man when they found out that he was a Rohingya Muslim. “We still don’t know who the men were, but some people do not like our presence in India,” Asad-ul-Islam said. Rohingya sometimes falsely claim that they are from the northern Indian state of Assam in a bid to dodge potential hostility.